Proaim 38ft Base Kit (P-W5P38-BASE). PROAIM 38' Base Kit is a camera crane video production package manufactured for making your filming projects more attractive and impressive. It is designed to extend your reach and to discover every unexplored angle. The Robust High-Grade Aluminum camera jib has triangular shaped design that makes it lighter weight for fast set-up & easy for one man to operate. Each section of the jib arm fits into each other very smoothly and securely ensuring strength and reliability. Every component of this video equipment is optimized design, fully considered safety and durability. Its Black scratch resistant Powder coated finish ensures durability in the harshest settings. 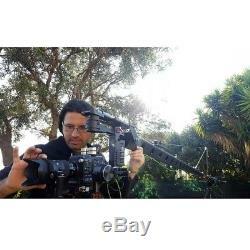 Comes with a rugged heavy duty tripod Jib stand that acts as a supporter for your steady shots. Camera Jib gives you the ability to get closer to action and follow the far moving subject from the side, front, back or top. WHAT'S IN THE BOX - 38ft Wave 5 Jib crane - Tripod Stand (HD-STD) - FREE Tools and Tool Pouch/Wrap - Storage & Packing Cases. WHAT YOU SEE IS WHAT YOU GET. FEATURES - High-quality camera crane perfect for any demanding angle - Expandable from 2ft (one section) to 38ft (Nine section) in 4ft increments. The Rear Control Center has provisions for mounting the Joystick Control box & Zoom Controller. 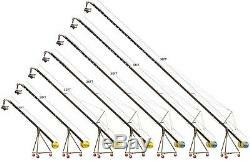 Jib can be also used at shorter lengths by reducing the sections. As a quality constructed reinforced jib it should last a lifetime. Weighing Capacity of Camera Jib. Jib Arm Break downs to. 10 Sections of jib arm. 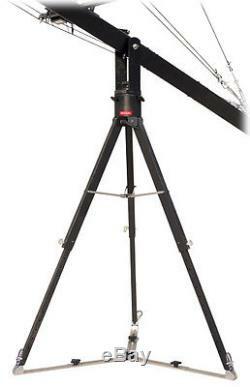 Rock Solid Heavy duty Jib stand (HD-STD) made of solid aluminum is foundation of Jib Crane. Has double locking system (Aluminum knob and Steel Pin Lock system as well) fully extendable. Spreader Max Opening from center. ARM CONNECTING BARS Each jib arm section fits smoothly and securely into another one. For better protection, it is fastened by a screw at the top which ensures better safety of your camera crane. Double security features guarantee its strength and reliability. Custom extruded sections connects smoothly & securely with one another. LCD MOUNTING PROVISION LCD Mounting Arm for LCD Monitor comes with camera jib arm. HEAVY DUTY JIB STAND (HD-STD) The Heavy Duty Jib Stand (HD-STD) is a Rock Solid made of aluminum, a robust and long-lasting camera jib stand ever built. It has fully strong solid hub assembly. The spreader feet are solid and have a double lock strong knob and locking pin as well. The spreader is fully extendable up to 2ft from its center. 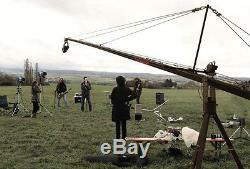 This Jib Stand supports and balances the camera crane perfectly without any problem. 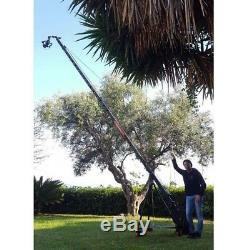 The Solid Jib Stand itself weights 17kg including spreader. Heavy duty stand ensures steady shots. 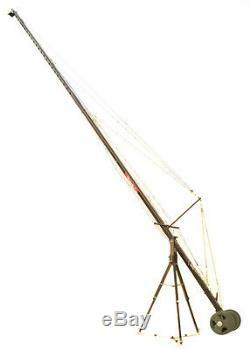 THE CRANE CAN BE USED IN SEVEN SHOOTING LENGTHS. Convertible design allows extension, pans, zoom-ins, and dolly-style shots. FREE TOOLS AND TOOL POUCH/WRAP Enables you to easily pack your tools in custom soft pouch. Rugged construction lets you manoeuvre into different positions. The Supportive accessories are for demonstration purpose only. We will try to give our best to our clients. There may be some delay in processing orders placed on weekends. The item "PROAIM 38ft Professional Video Production Jib Crane with Heavy Duty Tripod Stand" is in sale since Saturday, August 19, 2017. This item is in the category "Cameras & Photo\Camera & Photo Accessories\Other Camera & Photo Accs". The seller is "proaimcanada" and is located in Vancouver, British Columbia.